These illustrations were made by Bernard Blossac in 1949. Aren't they beautiful? They are both of evening gowns by the designer Jacques Fath. The House of Fath opened in 1937 and survived throughout the war. 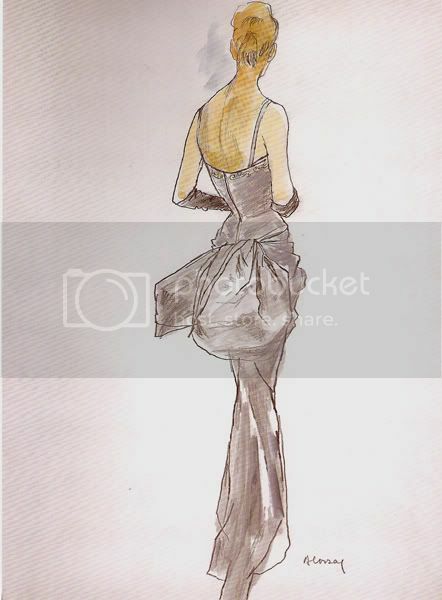 With Dior and Balenciaga , Fath was a major figure in couture the late 1940s and early 1950s. He died at the age of only 42. Fath was known for his occasion gowns, often featuring large bows and asymmetrical drapery. 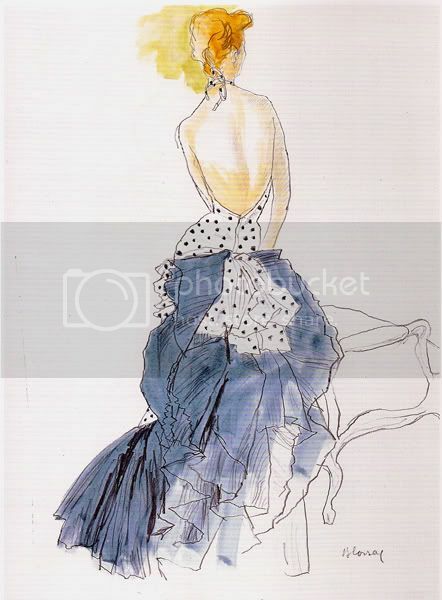 Fashion illustration was very big at that time, they often decorated the covers of magazines like Vogue and Harper's Bazaar. Blossac and Fath complemented each other's work. Blossac had the perfect line for Fath's dynamic designs. I just learned this today. Haha.. Been feeling pretty ill, so I've been stayng home all day, eating as much sushi and candy as possible, and looking at one of my favourite books "100 years of fashion illustration". There are so many amazing illustrators today, but I think it's even more interesting to look at the drawings from back in the day. The artists had such alive styles in the 40s and 50s, and when I look at the illustrations from the 20s I'm just amazad how modern they are, even today.